Many people were very taken with this band when they played at the Rock on Roddy concert so here's your chance. I Draw Slow, five piece featuring fiddle, double bass, banjo, guitar mandolin and vocals that play original old-time/country influenced music. 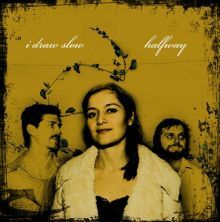 Recently issued an EP through www.myspace.com/idrawslow and it is now on the playlist of a number of internet radio stations, including UK Folk Radio, who have given the songs a glowing tribute. “..probably the best contemporary bluegrass album I’ve ever heard. Excellent vocals, beautifully crafted lyrics and great foot tapping music. I can’t praise them enough!” UK Folk Radio.